Following its initial arrival in SE Europe 8,500 years ago agriculture spread throughout the continent, changing food production and consumption patterns and increasing population densities. Here we show that, in contrast to the steady population growth usually assumed, the introduction of agriculture into Europe was followed by a boom-and-bust pattern in the density of regional populations. 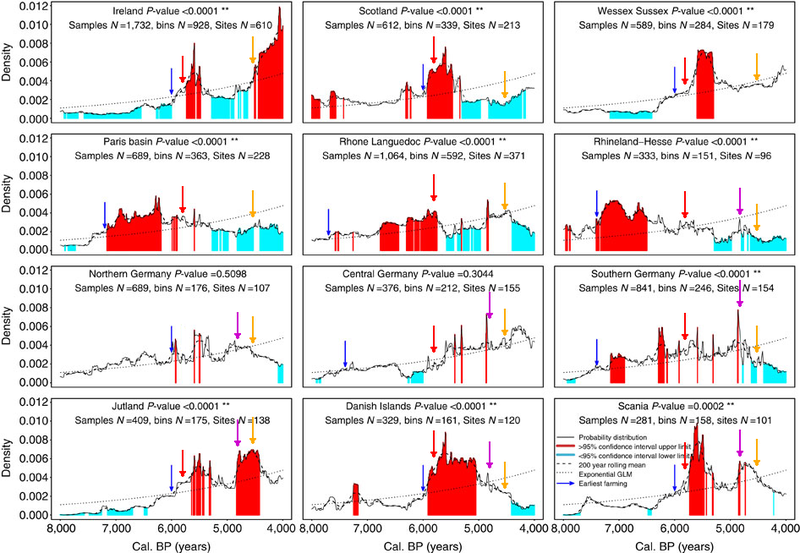 We demonstrate that summed calibrated radiocarbon date distributions and simulation can be used to test the significance of these demographic booms and busts in the context of uncertainty in the radiocarbon date calibration curve and archaeological sampling. We report these results for Central and Northwest Europe between 8,000 and 4,000 cal. BP and investigate the relationship between these patterns and climate. However, we find no evidence to support a relationship. Our results thus suggest that the demographic patterns may have arisen from endogenous causes, although this remains speculative. Figure 2: SCDPD-inferred population density change 10,000–4,000 cal. 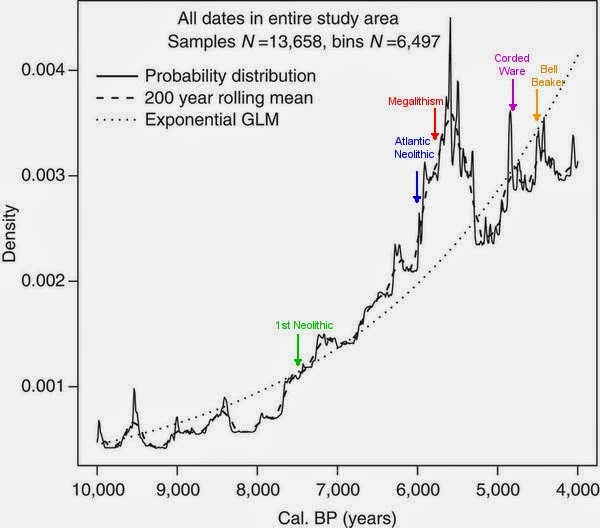 BP using all radiocarbon dates in the western Europe database. Colored arrows and their annotations are mine. I decided that it was important to mark the main cultural episodes for reference. 1st Neolithic refers to Impressed-Cardium and Linear Band Pottery cultures, which arrived almost simultaneously to Germany and France (of the surveyed areas), although the Rhône-Languedoc Neolithic is a few centuries earlier than the arrow, which has been standardized to 7500 BP. Atlantic Neolithic refers to the quite belated arrival of Neolithic to Britain, Ireland and Northern Europe (standardized at 6000 BP). This process was quickly followed and tightly associated with the widespread cultural phenomenon of Dolmenic Megalithism. It is most interesting that the main deviation from the pattern of regular growth concentrates in this period and is clearly positive. Corded Ware culture (Indoeuropean consolidation in Central and Northern Europe) affected only to Germany and Denmark-Scania within the surveyed regions. It was followed by a more widespread subcultural phenomenon known as Bell Beaker, which almost invariably cases manifests within pre-existent locally rooted cultures. Neither seems to be correlated with demographic expansions in the general overview. Figure 3: SCDPD-inferred population density change 8,000–4,000 cal. BP for each sub-region. Colored arrows, excepted the blue ones (which mark the local first Neolithic), are mine and mark general pan-European initial chronologies (not local!) for Megalithism, Corded Ware and Bell Beaker in those regions where they had some clear influence. Atlantic Neolithic and its associated Megalithic phenomenon are clearly related to notable demographic expansions in Ireland, Scotland, South England, Denmark and Scania. Megalithic influence may also be associated with some more irregular growth in South and Central Germany but rather not in France nor West Germany. A contemporary weak and irregular growth in North Germany (Brandenburg, Mecklemburg and Schlewig-Holstein) may be correlated with Funnelbeaker (with roots in Denmark) and the first Kurgan development of Baalberge and successor cultures (with roots in Eastern Europe), which would eventually evolve into Corded Ware. Corded Ware only seems related to clear demographic growth in Jutland (and less resolutely in Scania). Bell Beaker is only linked with clear demographic growth in Ireland (and much more weakly in South England and Central Germany), while elsewhere it is rather associated with decline. For the exact extension of the various regions as defined for this study, see fig. 1 (map). As provisional conclusion, it seems obvious to my eyes that the most important demographic growth processes were the various Neolithic cultures but that the Atlantic Neolithic (and associated Megalithism) was particularly dynamic. In contrast Indoeuropean-associated cultural phenomena had a much weaker impact, with some localized exceptions, and are generally associated with local demographic decline instead, at least judging from the archaeological record. An area holding a dense concentration of stones with engraved “cup marks” has been unveiled near Evanton, Scotland. The discoverer, Douglas Scott, has mapped the 28 decorated rocks and found that they are aligned with the rising and setting of Sun and Moon. He has also found a wide circular ditched enclosure, with a small central standing stone next to a cupmarked stone, which suggested it was the remains of a henge. The entrance of this enclosure aligns with the winter solstice sunrise. He believes that this was a major ritual center between the Neolithic and the Bronze Age. Sources: Ross-shire Journal, Stone Pages’ Archaeonews (via Pileta). Is Australopithecus sediba in fact Homo sediba? Both brain and hand (but also pelvis and ankle) make, in the opinion of some researchers, this australopithecine the best candidate for ancestor of our own principal ancestor: Homo erectus. Science Daily has a whole series on this theory and the facts that back it: 1, 2, 3 and 4 articles. Also at PhysOrg and some of the original papers at Science (pay per view of course): 1, 2, 3, 4, 5. More on the Southern Iberian Neolithic idols (in Spanish but with many nice photos) at Neolítico de la Península Ibérica. The oldest ‘pub’ of Scotland? 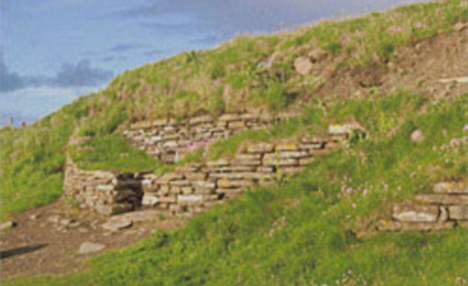 Chalcolithic or Neolithic (c. 4600 years ago) building at Jarlshof (Shetland) was at least a beer brewery and bakery. It is possible that the site was also used as tavern of some sort ··> Daily Record. Reproduction with Neanderthals was rare ··> France24 (and, update!, a criticism by John Hawks). Ötzi, the Chalcolithic herder from La Lagozza culture, was also Y-DNA G2a according to a video reported by Dienekes. This is the second time that G2a (a relatively small haplogroup today of quite clear West Asian origins) has been reported in post-Cardial Neolithic peoples in Mediterranean Europe. Earlier this year it was reported in the majority of a related population of Occitania (SE French state), together with some I2a. It is notable that both populations were culturally related, not just because of their shared Cardium Pottery roots, but also because of the Chassey–La Lagozza cultural fusion, which I’d dare suggest as precursor of the historical Ligures. Still it is hard to explain the apparent high frequency of the lineage back then and the low one today (c. 5% on average across Europe). As for high tier exceptions, nowadays G (usually G2a in Europe) reaches 12% in mainland Italy, 14% in Sardinia (reaching as much as 21% in some locations), 12% in Corsica, 7% in Austrian Tyrol, up to 14% in some locations of Croatia, up to 11% in some locations of Greece, 13% in Moldova, 12% in Portugal and 8% in Spain. It may be a fluke that 2/3 known lineages from the Chassey-La Lagozza cultural complex are in this category (it is statistically quite reasonable) but we can’t of course avoid rising an eyebrow. Amber-trapped feathers show light on the evolution of birds and dinosaurs ··> BBC. Preferred direction of spacetime challenges the Cosmological Principle which claimed that everything was equally boring ··> PhysOrg. Fifty new exoplanets discovered in a row ··> BBC. Star rips exoplanet to shreds with X rays ··> Discovery News. Is West African skull from Late Upper Paleolithic ‘archaic’ (meaning another species than Homo sapiens) ··> PLoS ONE. Gene influences behavior but… culture influences the gene that influences behavior ··> Not Exactly Rocket Science. Neanderthal cave in Jersey used almost continuously for 250,000 years, late extinction ··> BBC. Mariners already reached the island of Melos in Greece as early as c. 15,000 years ago, providing obsidian to Franchthi cave and other parts of the mainland, new chronometric method finds. At that time some of the Cyclades were joined in a single island but were not part of the mainland in any case ··> PhysOrg. Intriguing communal structure with water trough, mortar holes, etc. in PPNA of Wadi Faynan, Jordan, indicates some social centralization ··> Neolítico Ibérico[es], Mithen et al 2010 (PDF). 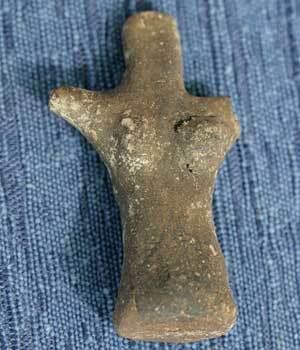 Chalcolithic “goddess” idol found in Estepona (Málaga, Andalusia). This kind of “violin” figurines are typical specially of the Almerian culture (coalescing into Los Millares civilization) but are rarer elsewhere ··> Pileta de Prehistoria[es]. Bronze Age Scottish mummy made up of parts ··> BBC. Argentinean maternal lineages are Native American very often. A new open access study reveals that 41-70% of maternal lineages, depending on region, are Native American. However these may be in many cases from other origins than Argentina itself. This figure is different from the overall Native ancestry which is more in the 20% zone (other research). ··> Laura Catelli et al. 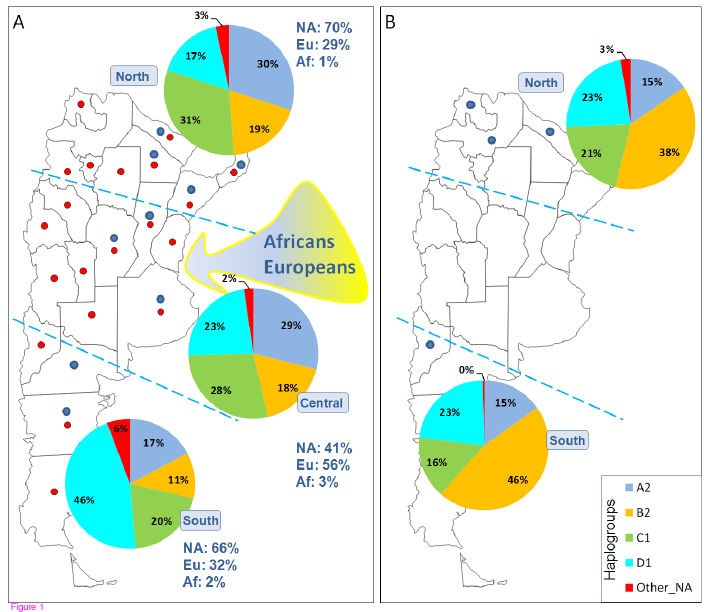 The impact of modern migrations on present-day multi-ethnic Argentina as recorded on the mitochondrial DNA genome. BMC Genetics, 2011. Open access. Frequency patterns of the main hgs in Argentina in the admixed groups (A) versus the Native American communities (B). NA: Native American component; Eu: European component; Af: sub-Saharan African component. Red dots indicate sampled locations as undertaken in other studies from the literature; blue dots indicate the sampled locations in the present study. Bacterian genome reveals what is essential to life. Only 12 of the genome is essential, at least in C. crescentus. Among these genes, there are 91 segments whose functions are totally unknown so far ··> Science Daily. Early farmers of Scotland died violently… but then they were buried in a monument, the Tomb of the Eagles (left), at Isbister. Out of 85 burials in this tomb, 16 have clear evidence of head trauma caused by weapons. Some of these injuries were healed but others not, meaning that they were killed by them (or related violence). The tomb’s age is of c. 3000 BCE, a few centuries after farming began in the area. Full story at Daily Mail. 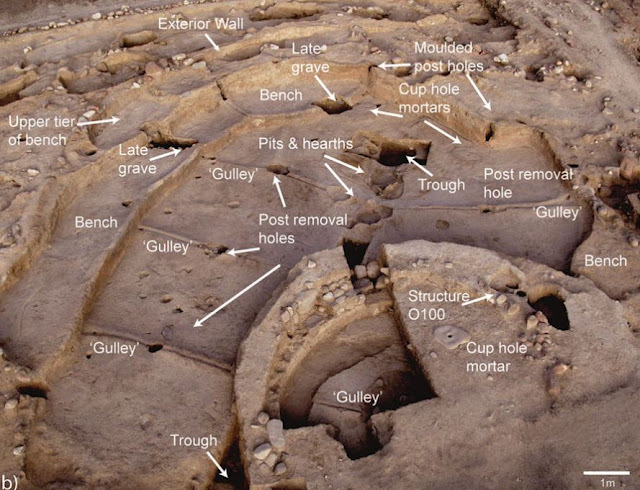 Also in Scotland it has been announced the discovery of rock art that could be Neolithic near a recently discovered chambered tomb (dolmen) at South Ronaldsay, Orkney, reports Orknejar. Original source: Stone Pages Archaeonews bulletin.